It will soon be Halloween and I am sure many will be enjoying some fun activities. If not then surely it is time to get a life :-) How about starting a Halloween stamp collection. There are not that many stamps that I can find with Halloween images on them. And, the history and cultural background would surely make for an interesting study. For example, did you know that in the post-Civil War era, many American postmasters carved killer cancels out of cork. For their cancels, they used all sorts of images that have become synonymous with Halloween. 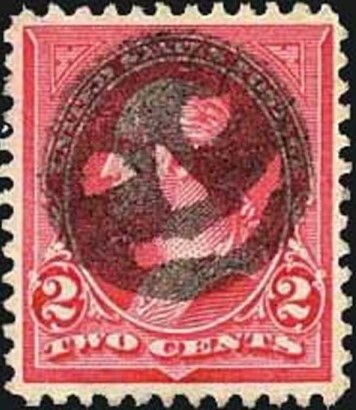 One is the skull-and-crossbones cancel used on the 3¢ green George Washington stamp, and another is the jack-o'-lantern cancel used on the 2¢ carmine Washington. 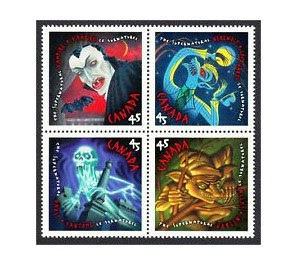 From a more modern perspective you might enjoy this block of 4 stamps from Canada, showing a vampire, a werewolf, a ghost and a goblin. 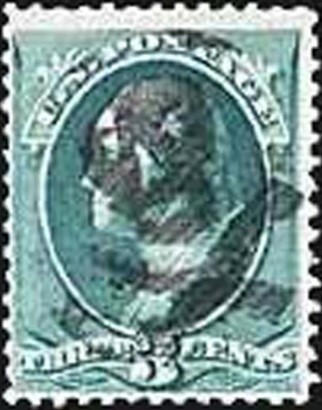 These stamps were issued on October 1, 1997. Whatever you are doing on Halloween please be safe and enjoy. Hello, I have been having writers block. That is my only excuse. I cannot think of any stamps to show and write about. I am writing for a few magazines but just cannot get motivated for the Blogs. 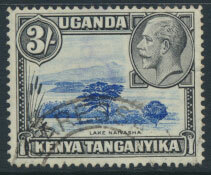 Having said that I have just finished listing more Kenya Uganda Tanganyika / Kenya Uganda Tanzania issues to the online store. There is a pretty useful selection of the various George VI perforation variations so if British Commonwealth GVI is something you collect perhaps you will enjoy looking and be able to find something to fill a few gaps in your collection. 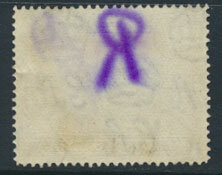 While studying our stock we not only found some nice clean and well centered stamps, we also found some rubbish. Most gets thrown in the garbage if it is too damaged, or the Childrens Corner box if it is collectible for children starting to learn about stamps. Some we do list as spacefillers. The above for example. It looks quite nice doesn't it. George V fron the definitive 1935 issue. But turn it over and this is what you have. Must have been in our stock for many years and we just never saw it before. SG 120, Scott 56, Crying shame so we have listed it as a spacefiller. 2017 SG cat has it listed at £15. Moral of the story, some badly damaged stamps can still be useful to fill a gap.